(Nanowerk News) MIT chemists have developed new nanoparticles that can simultaneously perform magnetic resonance imaging (MRI) and fluorescent imaging in living animals. 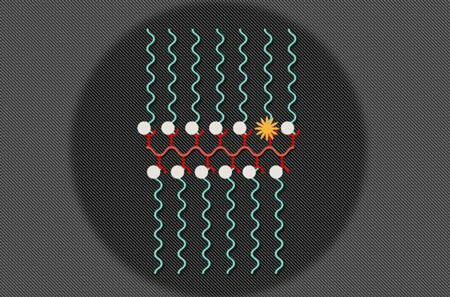 Such particles could help scientists to track specific molecules produced in the body, monitor a tumor’s environment, or determine whether drugs have successfully reached their targets. In a paper appearing in the Nov. 18 issue of Nature Communications ("Redox responsive branched bottlebrush polymers for in vivo MRI and fluorescence imaging"), the researchers demonstrate the use of the particles, which carry distinct sensors for fluorescence and MRI, to track vitamin C in mice. Wherever there is a high concentration of vitamin C, the particles show a strong fluorescent signal but little MRI contrast. If there is not much vitamin C, a stronger MRI signal is visible but fluorescence is very weak.